Were £64.99. 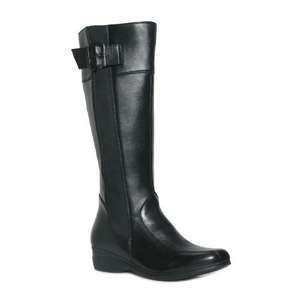 Women's Black LEATHER High Leg Wedge Boot with Elastic Panel to Side for Easy Fitting, Buckle Detail to Side and Full Length Zip Fastening. This is with the extra 20% off that Shoe Zone are running at the moment. I think this is a fantastic price for boots that have a leather upper. I had mine delivered today. They do say 'wide fitting' on the label but they are NOT. I need slim fitting boots and these are brilliant. They do have an elastic panel but in my opinion they still wouldn't fit a wide fitting person. I would say they come up a little small in foot length though. Only size 3 and 6 showing in stock on their website at the moment, may be in store as well. Thank you to chuckiedoll who posted about the extra 20% off. You're welcome! Amazingly, I have ordered the same boots! Awaiting delivery of mine still though! Hope they fit from what you have said! Nice boot, but not my size - still HOT. Only size 3 left now. Would have given the 6 a try. Mine arrived this evening and agree with op, definately not for the slightly wider calf!